LOS ANGELES, California (CNN) -- The famed Roxy Theatre in West Hollywood, California, is filled to capacity on a Wednesday night, and it's only 8:30 p.m. What kind of star could bring out this kind of crowd -- and at such an L.A. early hour? Zee Avi posted her songs on YouTube and attracted the interest of a record label. How about a Malaysian Internet sensation with a debut album that was released one day earlier? Such is the buzz around Zee Avi, a 21st-century chanteuse in the most literal sense. Her spot-on Billie Holiday phrasing and honey-sweet voice would have had her entertaining in a café in the 1930s. In this era, she was discovered on YouTube by an indie rocker -- Patrick Keeler of the Raconteurs -- and is on Jack Johnson's record label, Brushfire, which has partnered with Monotone Records to produce her. Avi's set of engaging acoustic offerings included an enthralling cover of Interpol's "Slow Hands," and was delivered with self-assurance and poise. In an interview two days earlier, she credited her parents and grandfather for inspiring her love of music -- sometimes through karaoke. "Got to love that," she says. Avi, 23, also acknowledges the influence of her native Malaysia, which kept her open to new ways of thinking. 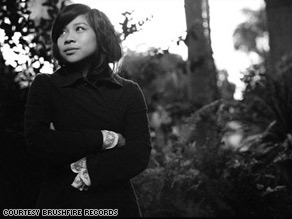 Her love of music -- and of the Malay melting pot -- is reflected in her debut album, "Zee Avi" (Brushfire Records). The album, which was released mid-May, fuses early 20th century American standards with modern sounds on songs such as "Kantoi" and "Just You and Me." CNN spoke to the singer-songwriter just before the album's release. The following is an edited version of the interview. CNN: You can hear influences on your album from a wide range of artists and eras, from Billie Holiday to Cat Power. How did all of that find its way to you? Zee Avi: Music is universal. With the media and the Internet you can gain access to everything. By listening to many different types of music it gives me many ways to fuse it with my own [ideas] and then I play whatever comes naturally to me. CNN: How did you develop a love for music and develop your particular style? Avi: I think if it's in your blood, it's in your blood. If you love golf, then you would find which wood is good for this and which putter is good for that. It's a passion altogether. Same with music. CNN: What made you want to put those songs on YouTube? Avi: One of my friends missed my first gig. I played my first [original] song "Poppy." He's a poet and a writer and I wanted his feedback because I respect his work. So he said to send the song over to him. I didn't know [how to send it], but I did have this webcam on my dad's laptop and one of those call center headsets. So I ended up putting it on YouTube and he watched and I said, "OK, I'm going to delete it now." He said, "No, let it nest there and see what happens." I remember I got one comment and I was so happy (laughs). Then I put my second video up and got three comments. It just went on from there. CNN: And you got a call from Monotone Records. Avi: One of the guys who worked there messaged me on YouTube. He said, "Hey, we represent White Stripes, M.I.A., the Shins" ... and I went "gasp-gasp-gasp." He said they were interested in talking to me. Next thing I knew we had a rough draft of the recordings. CNN: What would you be doing right now if there was no Internet? Before the music thing happened, I wanted to study creative writing and philosophy. When I put these songs on YouTube I certainly never meant it to be a marketing tool. I had no expectations of [what it became]. CNN: Musically, the album is almost wistful, but darkness permeates the lyrics. Avi: Everybody has that side of their personality that they don't show anybody. Music is my outlet for that. I also have a positive side -- let's not be a wet blanket. It's not my intention for a song to be [overly] emotive or anything like that. Velvet Underground's "Who Loves the Sun" plays a very important part in how I write songs. That song is very ironic. If you're singing along to that song, you're singing this happy melody but you're actually singing about someone with a broken heart. It's sarcasm too, in a way. It's made such an impact on me, like the fact that you can do that [with songwriting]. CNN: Where does the darkness come from? Avi: Most of my songs are about relationships, and as anyone knows relationships aren't always sunshine and rainbows. Even when it's good sometimes it's bad. I try to capture the reality of it. It can be a fairy tale, but it doesn't always end up happily ever after. Fine -- prince marries princess and they live happily ever after. But what's "after"? CNN: As a self-described woman of simple pleasures, how are you dealing with this new whirlwind lifestyle? Avi: If there's one thing my parents have taught me it's to stay grounded. I always keep that in mind. Whatever success I achieve ... I'm grateful. But I don't expect anything from it.